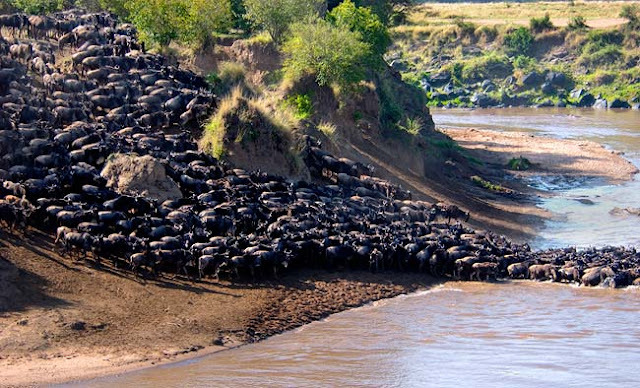 Once a year, over a million wildebeest make an incredible journey across the Serengeti in search of food and water. They’re followed by hundreds of thousands of other hoofed, grazing mammals – known as ungulates – like zebras and gazelle. The Serengeti is an area that spans around 30,000 square kilometers, reaching from the north of Tanzania down to south-west Kenya. It name is derived from the language of the Maasai, fierce warriors who lived in the area, and means “Endless Plains”. The migration that takes place in the Serengeti is the largest terrestrial mammal migration in the world and is ranked as one of the world’s ten natural wonders. The Serengeti is home to about 70 large mammal species, as well as 500 bird species. Its biological diversity is due to the diversity of the habitat, which features forests, swamps, grasslands and riverine woodlands. Among the most common large mammals found in the Serengeti are Blue wildebeests, gazelles, zebras and buffalos. What causes these creatures to set off on this synchronized trip? In the 1890s, a rinderpest epidemic wiped out much of the Maasai and animal population in the area. In the absence of humans, without much fire or poaching, the landscape of the Serengeti flourished over the following 30 to 50 years. Starting in around the 1960s, the wildebeest population of the area increased dramatically, from what had been around 260,000 to a staggering 1.4 million. Due to their increased numbers, the herds were forced to migrate in search of water and grazing pastures. This resulted in the 500 km round-trip route that they have been following since the phenomena was discovered in the late 1960s. The great migration offers viewers the chance to see not just the staggering sight of millions of grazing mammals crossing the great plains, but also the predators that trail them. During the large herd migrations, which partially overlap with many of the mammals’ breeding seasons, predators are never far behind. At least 500,000 calves are born each year close to or during the period of the migration itself. Together with old, dehydrated or underfed animals, they’re particularly vulnerable – especially when the herds cross the myriad rivers that bisect the migration route. Stragglers are targeted by a range of predators, including prowling lions and cheetahs. Scavengers follow in the wake of the herds, with wild dogs, jackals, hyenas and vultures never far behind. The migration begins shortly after the breeding season begins in March, and lasts until about October. The peak time to witness this incredible spectacle is in the July to September period, when many of the animals can be seen at the Masai Mara National Reserve in Kenya. Post courtesy of Jeff from Thomas Cook Tours. The UK tour provider offers holidays to Kenya and Tanzania which include safaris in the Serengeti.